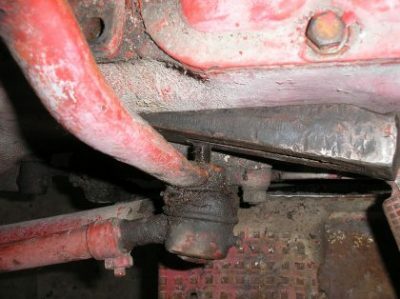 The tie rod or “draglink” ends on the N tractors have a tapered stud that goes in to the steering arm and hold them tightly in place even after the nut is removed. It takes some mechanical force to pop the stud loose from the taper. 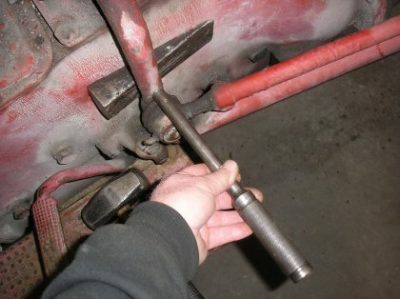 Generally, this is done with tie rod separator tool commonly called a “pickle fork”. However, the pickle fork tends to destroy the boots on the tie rod ends and lots of times you will want to save those. Many years ago I picked up an old steel wedge that I believe was originally intended to split wood. 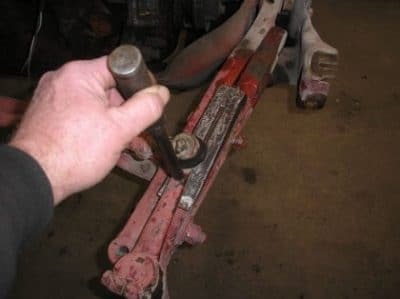 This wedge fast became my favorite tool for removing tie rod ends from the tractors. I recommend loosening the nut about halfway and leaving it on the stud to prevent damage to the threads and keep the tie rod end in place after it’s loose. In these photos the nut has been removed completely. Do that at your own risk. First, slide the wedge between the tractor housing and the stud end and tap it into place so it puts just a light pressure against the stud. The wedge will distribute the force over a large area of the housing so it won’t be damaged. 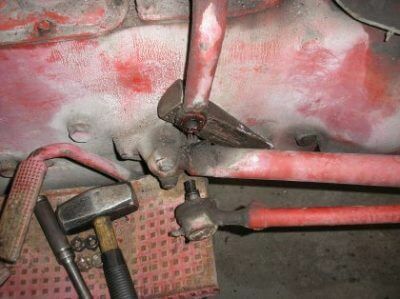 Then, place a large drift against the arm right next to the tie rod end. Give it a sharp rap with a hammer and the tie rod stud will pop right out. 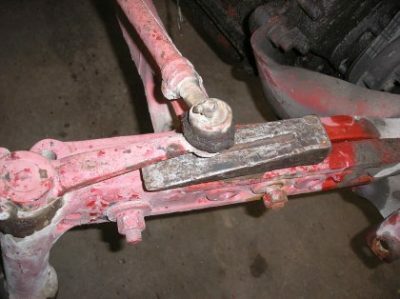 The front tie rod ends are done the same way over the axle extension. If you have the later style steering arms you might need to put a spacer under the wedge or use a thicker wedge. One sharp rap and they pop right out, too. This is a quick, simple method and there is no damage to the tie rod boots.